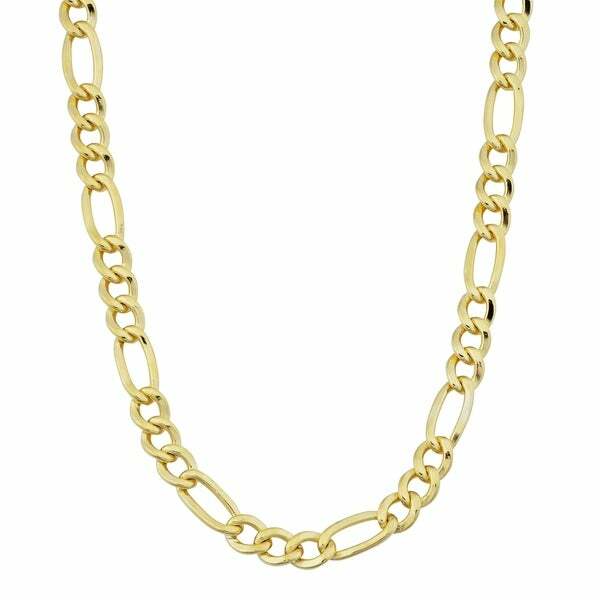 Accentuate your look with the sleek and refined style of this gold-filled Figaro link chain necklace. Flattened links of varying sizes are patterned throughout this slim chain necklace for a classic appeal. This sleek necklace is created with a 14k yellow gold-filled metal and is available in several different links to accommodate your personal taste. This finely crafted gold necklace features a high polish finish making it stand-out and will immediately update your jewelry collection. The Figaro link chain is a timeless gold accessory that can be worn everyday for an added glamorous touch. This womens or mens gold necklace secures with a lobster claw clasp that is comfortable and provides sturdiness. For a more fashionable approach, layer this one of a kind gold necklace with other gold chains. This gold chain is 4.2 millimeters wide, making a bold statement worn solo. This 14k necklace is offered in a variety of lengths from 18, 20, 22, 24, 30, and 36-inch lengths. This Fremada 14k Gold-filled necklace is right for just about any occasion. It’s bold, but stylish. I find it great to wear with sportswear to “dress up” a casual look; I’ve also worn it with plain gold hoop earrings and a suit for a professional look. Versatility, class, and a great value make this necklace a terrific choice. I purchased a chain necklace prior to this and it did not meet the qualifications I neede. However, this was the replacement and I am very pleased. I purchased this for my grandson. Apparently chains are the "in" thing with preteen boys. He was so thrilled and hasn't taken it off since I gave it to him. The chain is quite classy. I would recommend it to friends and family. LOVE this necklace. It is heavier and sturdier than expected. The gold looks amazing. I purchased the 30 inch, which is the perfect length for me. I am beyond happy with this purchase! I am enjoying wearing my Figaro Link Necklace. It is a very attractive necklace and I have received compliments on it. I would buy again if needed for gifts for family and friends. Chain weighs!! Feels really nice around the neck. It sparkles and shines. In the sun light it is absolutely beautiful!!! I have a lot of real gold. I am always feeling touching making sure it’s steal on. With this chain i can feel the weight. I used to would have never bought overlay. You can’t tell it is once again absolutely beautiful. I have children. You would like to to think of their firends as firends. NOT always the case!! Sorry 😐 to say but in this busy life we take stuff off lay it around. Hey whats a 100$ comparison to 500$ alot for something to grt lost or worse. If your a person like me and say I would never buy that. Think again am 40 yrs old. I patted myself on the back. Just buy one it cost nothing to send it back. By the way club o members. Chrvk out those deals. This is honestly a great chain thst i can wear and be proud of. Be completely comfortable not losing my mind where did i lay it!!! It’s simply beautiful by the way!!! Very unhappy with this necklace! It turned my husbands neck green! Total waste of money! This was an amazijng deal. Way better quality then the jewelry stores for less!!! Same type of necklace but very hollow was over 400 bucks at Kay's. Anything similar to this was over 2,000. Bought this for a gift for my brother. Amazing!!! This chain looks like the real deal. Nothing but compliments. Stunned by the bracelets beauty and high quality look. Nice necklace, very delicate definitely made for women. "Is this an appropriate chain for pendant attachment?" "if the necklace do fade will you refund the money?" "what is the base metal of this chain"
Gold filled is where a layer of gold is permanently bonded to a core of base metal using heat and pressure. "Is this chain smaller links for a woman or larger for a man?" Medium, for either. I am female and I love this chain for any occasion. "Can it withstand getting wet constantly without turning your neck green?" "Does this turn your neck green? "